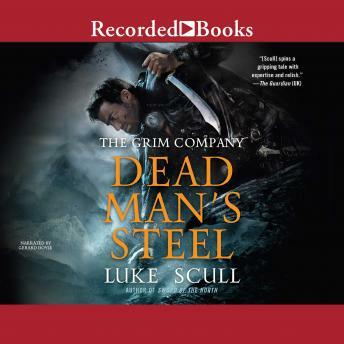 As the 'gripping'* epic from the author of Sword of the North continues, the Grim Company must battle a dangerous new enemy that is determined to destroy all of humanity... In the City of Towers, former rebel Sasha and her comrade Davarus Cole struggle to keep the peace between the warring mages who vie for dominion. But when the White Lady sends Davarus south to the Shattered Realms to seek allies among the fallen kingdoms, he finds that his hardest battle may be one fought within. The godly essence now residing within him offers power that could be used against the Fade-but with every death that feeds It, Cole risks losing a part of himself. An association with a Fade officer grants the Halfmage Eremul a position of privilege among Dorminia's new masters. He witnesses firsthand the fate that awaits humanity. But with his magic pitiful in the face of the Fade's advanced technology, the Halfmage must rely on his wits alone to save whom he can. And in the frozen north, the legendary warrior Brodar Kayne fights a desperate battle for his people. He is running out of time: an ancient evil sealed beneath the mountains is about to break free, an evil that is older than humanity, older than the Fade, older even than the gods-and it will not stop until the entire world is drowned in blood.